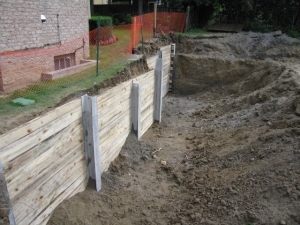 Soldier piles and lagging is a commonly used excavation support system. Steel piles are installed in a vertically drilled hole and embedded below the excavation depth to provide the necessary passive resistance. Timber lagging is typically either installed behind or clipped to the front flange of the pile to support the soil behind the excavation and transfer the load to the piles. Piles can be cantilevered or braced with walers, rakers, struts and/or tiebacks. 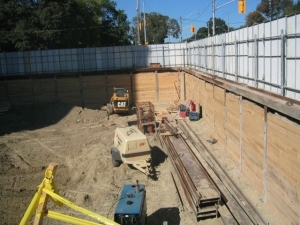 The HCM Group commonly utilizes a design-build approach, working closely with RWH Engineering Inc., to provide shoring solutions specifically tailored to meet the project’s requirements. Our closely integrated project management and in-house engineering allows for timely submissions and real-time on-site problem solving. The HCM Group continues to invest in the right equipment to meet our customer’s requirements. We feel confident that our innovation and design-build approach to foundation contracting will provide benefits to your next project.